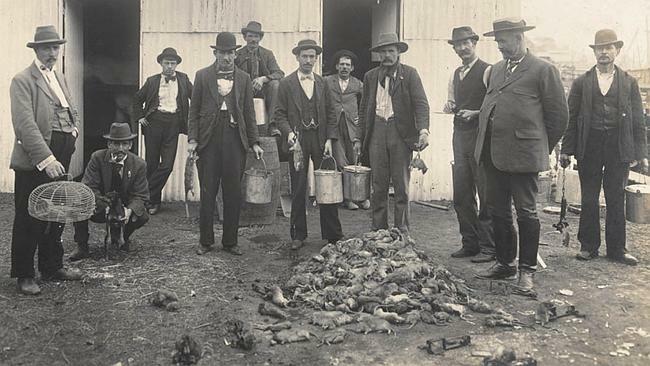 The arrival of the bubonic plague in Sydney in January 1900, played into the fears of Anglo-Australians on the Pacific rim of “the coloured races”, “Asiatics”, and, essentially, anyone of non-Anglo-Celtic stock (and, let’s face it, Celtic people from Ireland also had some problems here). After all, one of the first pieces of legislation of the new federal parliament formally introduced 12 months later was the White Australia policy. While the major group feared was the Chinese, reference was also made in discussions in Sydney to “Syrians and Hindoos”, which was a portmanteau term to cover anybody from the Middle East, and no doubt including Lebanese people. 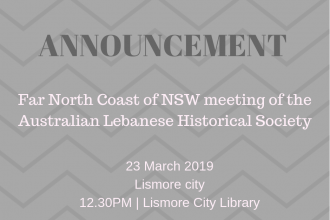 Indeed, terms like Near East, Middle East and Far East, tell us much about the British origins and cultural loyalties of the people in Sydney who used them: From where we sit in Sydney, these areas look suspiciously like Far West, Middle West, and North West. The authority of this expert opinion may have been somewhat vitiated by its apparent presumption that the normal Anglo-Celtic method of slumber was to do it prone in the centre of the room, and that anything else was undesirable. Some may regard its expertise as being even more tattered by its lack of reference to the effects of poverty and to inadequate, unaffordable and insanitary housing. On the last, at least Alderman Parkes rebuked Alderman Sullivan by commenting that the area in question had been inspected and found to be clean. So far as he was concerned, the problem was one of a lack of building regulation. Well-intentioned as it was, and true as far as it went, this particular attitude to housing crisis was entirely consistent with the long-term response in Australia: housing problems could be fixed up by building regulation. (4) Certainly, redistribution of resources or even minimal social security were scarcely on the agenda of a society very much shaped by laissez-fairesocial and economic policies. In any event, Alderman Poole commented that the Council had no legal power to deal with the problem. When these people came into the district in large numbers some time ago, the Council had done all in its power to keep them out, but was powerless. Reports were furnished by the local inspector every fortnight, and the attention of the government was called to the matter, but to no avail. Alderman Sullivan’s suggestion was that the Council should instruct their inspector to visit these people continually, to make it so uncomfortable for them they would leave the district or keep their premises scrupulously clean. The very next day, a council delegation paid a call on Dr. Ashburton Thompson, President of the NSW Board of Health. (5) The delegation comprised the Redfern Mayor, Alderman Clarke (also a Member of Parliament), and Aldermen Parkes and Vernon. The delegation was introduced by the local Member, Mr. J.S.T. McGowen who was, in fact, soon to be Labor leader. Unusually for a Labor politician, McGowen was also a Protestant Sunday School superintendent – his rector was the Rev. F.B. Boyce, of St. Paul’s Anglican Church, Redfern, and a long-termslum reformer. Thompson was no fool: Indeed, his detailed study of the effects of the bubonic plague outbreak in Sydney gained international recognition as a landmark study in the causes of bubonic plague. (6) He listened patiently while the delegation complained that the Health Act was not able to cope with the present menace to the health of residents in Redfern and other parts, through the insanitary mode of living on the part of Syrian, Indian, and other coloured races. The delegation was particularly outraged that as the law stood they did not have the right to do bed checks after 8pm to inspect how many people were sleeping there. Thompson probably agreed about the inadequacies of the Health Act (although perhaps not necessarily on the precise issues that exercised the delegation), as he was engaged himself in efforts to strengthen it; and he also agreed about the problem of defining common lodging houses. The latter is clearly still a problem, as a century later adequate legislation has still not been introduced to deal with boarding houses. To pacify the delegation, he agreed to pay a visit to the area to see what could be done. It is, however, unlikely that he agreed about the habits of particular ethnic groups. The report he produced on the plague outbreak a few months later was notable both for its scientific objectivity and for its liberality of outlook, even if he was, inevitably also a man of his time. For example, in relation to the notable Anglo xenophobia in relation to the Chinese, it was Thompson who pointed out that in a total metropolitan population of 456,000, Chinese numbered less than 4000 altogether – and of the total number of 293 cases of bubonic plague in Sydney (later to rise to 303), only 10 were Chinese. The rest were among the whites. (7) If nothing else, this put paid to any notion that non-Anglo people had a peculiar propensity to contract diseases like bubonic plague: as it did also, in relation to beliefs that they were responsible for the conditions that made the plague possible. Pure and simple, the plague was spread by fleas from plague-infected rats, and this bore more relation to ships, ship cargoes and wharves and conditions of wharf storage than it did to housing conditions. A week later, the plague struck the impeccably-Anglo Arthur Payne in Sydney, at the other end of town – in Ferry Road, Dawes Point, just above the wharves. Payne was lucky – he recovered. A third of the 300 victims did not. And not much more than a year later – on May 10, 1901 – Australia’s first Governor General announced as the first item of business for the Commonwealth Parliament introduction of a Bill for restriction of the immigration of Asiatics. Even though a century ago, an objective scientific study (only one of many) established once and for all the non-race-related nature of disease causation, the fear and loathing racism represents remain with us. And it is hardly more sophisticated now than it was then. The same accusations of dirt, disease and unspeakable habits still persist against the latest victim group: usually, of course, simply the most recent non-Anglo arrivals (and also, ironically, against the longest-term residents of all). Sydney Morning Herald, 31 January, 1900, p. I0. 2. Sydney Morning Herald, 5 January, 1900, p. 12. 4. See Patrick Troy. “Government housing policy in New South Wales 1788-1900”, Housing Studies. Vol. 3, No. I. 1988. 5. Sydney Morning Herald, 8 January. 1900, p.5. 6. J. Ashburton Thompson, “Report on the Outbreak of Plague at Sydney”, NSW Legislative Assembly Votes and ProceedingsVol. II.. 1900, pp. 1235ff. 8. Sydney Morning Herald, 23 January, 1900, p. 12. The story in issue No. 3 of the Newsletter about Syrian/Lebanese Hawkers and their colony at Redfern prompted this response from the late Harvey Volke. Harvey was completing a Phd. on social policy in Australia and drew this story from his research.